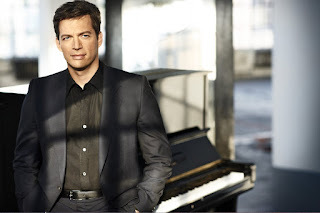 I am a huge Harry Connick Jr. fan. I actually met him once, when I was in high school, and I was incredibly impressed. We have quite a few of his albums, as well as movies he was in. Seriously, I could watch Memphis Belle everyday. So, I was beyond thrilled when the One2One Network sent me his new CD "Your Songs" to review. Naturally, I loved it. Granted, I would probably adore the sound of this man's voice if he was singing "C is for Cookie", but truly he is amazing on this album. Bringing his own distinctive style to classic songs, he had me dancing around the house in no time. I truly think he is one of the greatest singers of our time. He actually puts me in mind of a time gone by, one with big bands, men in tuxes, ladies in the latest fashions...all gliding across a dance floor in a grand club or hotel. Harry Connick Jr.'s smooth voice has me wanting to dress up to the nines and go dancing too, not in a club of today, but say 60 years ago. Check the CD out yourself and you will see what I mean. The track list is full of songs you probably know. Prepare to sing along throughout the whole album. My favorites are The Way You Look Tonight, Smile, and Some Enchanted Evening. Did I mention that my broom and I can do a mean Fred & Ginger impersonation while listening to this album? Seriously. You just want to dance when you hear it. So, in case you didn't know this by all you've read so far, I am crazy about this album. It is honestly one of the best albums I've had the pleasure of listening to in quite awhile. Keep this baby in mind when buying gifts this holiday season, it would be a hit I bet. I really recommend this wonderful album! Thanks to the One2One Network for providing me with a review copy of this album. I was not paid for this review. Awww thanks for the memories. I love Memphis Belle and his accent when he says the line "you can have my bullets too", just makes you wanna melt.